It was all so simple.. just one 15 minute chore, and I would be on my way to Brooklyn for WWKIP day. 2 hours later, and it was good I hadn't started out to Brooklyn—but I had started feeling ill. Fever, chills and aches—nothing serious—just an acute attach of a long standing condition. 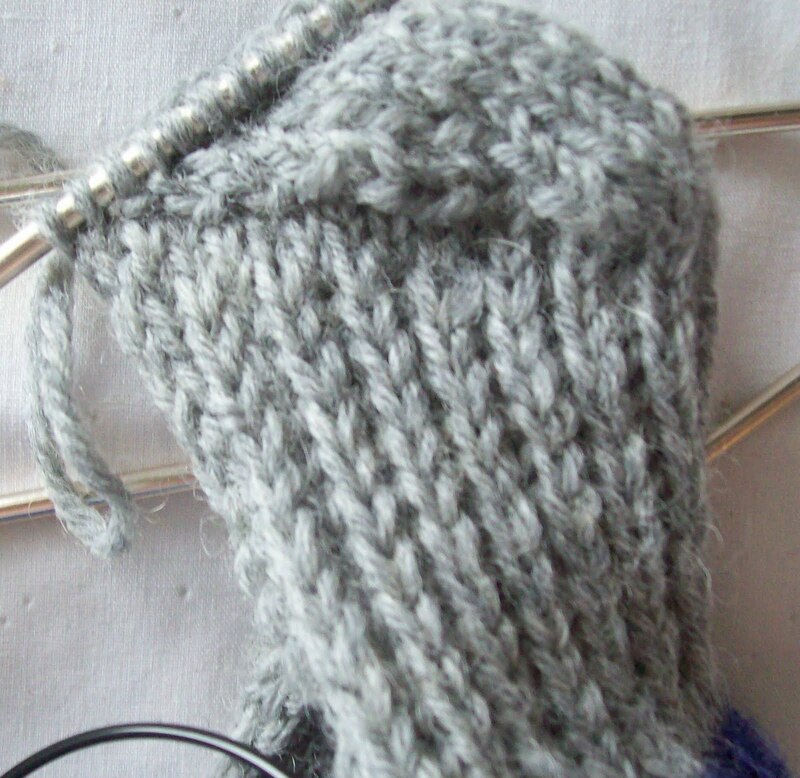 Still I resolved to knit. 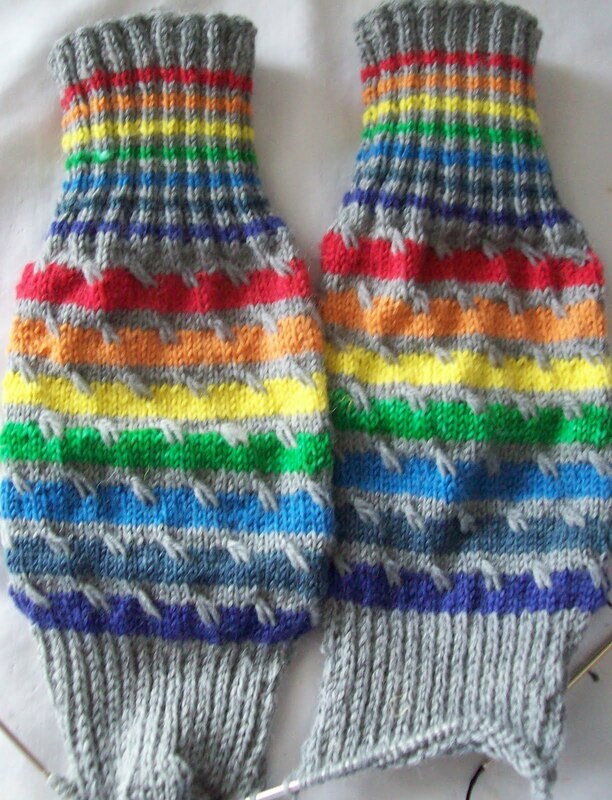 Violet was done Saturday—and Roy G Biv was complete on the legs. 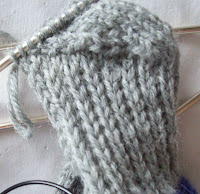 One round of grey, and it would be time to start the heel flaps. Saturday evening, all but the last Violet end got woven in. 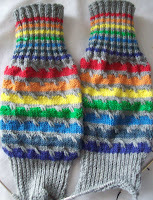 So the cuff and leg and both knit and finished. When finished, the turn—and look at this! And the other side? 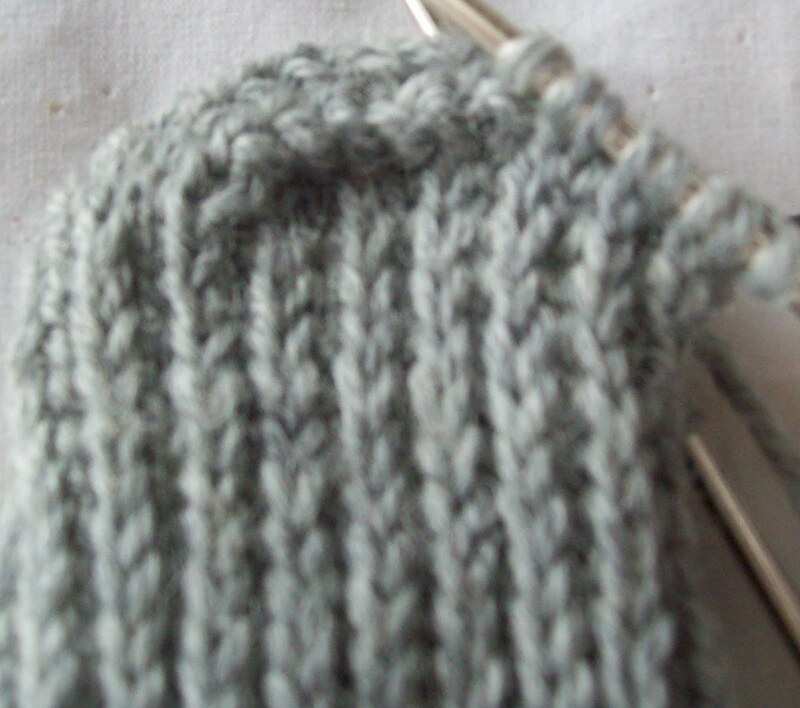 Its has a bunch of stitches still to be worked –it appears to have a version of a square heel turn—and scads more stitches to go.. but it would be to long and too narrow! SO, knitting with a fever is not a good idea! Feeling a bit better today—and will frog the turn, and do it again. 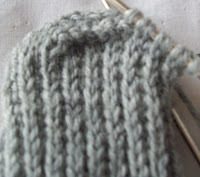 Then start on the gussets and race my way down to the cuff! I think I will hold off starting the Pagewood Farms LACE scarf for the duration (of the fever) –if I can't turn a heel, I don't think I should be doing lace! I'll take my anti-inflamitories, try to get some water aerobics in (if the weather co-operates!) to keep my joints limber, and soon enough, all will be well again. Sorry you aren't feeling well. Get better soon. Cute socks! I hope you're feeling better soon! The socks look lovely. I can't wait to see them finished.